Pink Gin is a cocktail made fashionable in the United Kingdom in the mid-19th century, consisting of gin and a dash of 'pink' (Angostura bitters, a dark red extract of gentian and spices, known from the 1820s at Angostura, Venezuela but now made in Trinidad and Tobago). Lemon rind is also commonly used as a garnish, with the citrus oils subtly complementing the flavour. Left: A bottle of Angostura Aromatic Bitters, the essential ingredient of Pink Gin. Pink gin is a typically English way of enjoying gin. It is widely agreed that the drink was first created by members of the Royal Navy, as a way of making Angostura bitters more enjoyable. 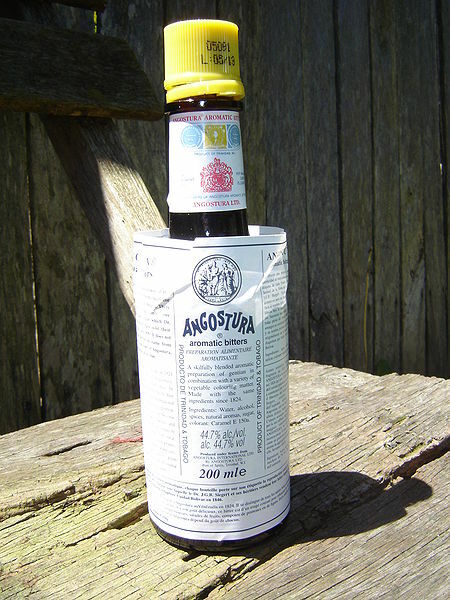 Angostura bitters were discovered as a cure for sea sickness in 1824 by Dr. Johann Gottlieb Benjamin Siegert, who subsequently formed the House of Angostura, a company selling the bitters to sailors. The Royal Navy then brought the idea for the drink to bars in England, where this method of serving was first noted on the mainland. By the 1870s, gin was becoming increasingly popular and many of the finer establishments in England were serving Pink Gin. Chill the glass, then coat the inside with the Bitters. Add the gin very well chilled, garnish and serve. Serve in a cocktail glass, straight up; without ice. The traditional garnish is a shave of lemon rind. You can obtain this by removing about an inch strip of lemon rind with a potato peeler. Though there are no major variations of pink gin, many bartenders vary the amount of angostura bitters used. Occasionally the drink is topped up with iced water. A bartender may ask the customer whether he wants it "in or out", upon which the bartender swirls the angostura bitters around the glass before either leaving it in, or pouring it out (leaving only a residue), and then adding the gin. It is also common, especially in the UK, for pink gin to be served as 'pink gin and tonic', typically consisting of 4 dashes of angostura bitters and 2 shots of gin, which is then topped up with tonic water. This is served in a highball glass over ice, and then can be garnished with lemon.